Often material safety data sheets refer to the thermal stability as an intrinsic property of a substance or mixture. In fact, this is an oversimplification of a concept that must be defined in a more comprehensive way. Thermal stability testing aims at collecting reaction rate data and applying that data to assess whether a specified quantity of material can be used in a way such that runaway reactions are avoided. This is important when considering processing, long-term storage, or shipping of a material. The Differential Scanning Calorimeter (DSC) measures the heat flow to or from a sample under controlled heating conditions. A small amount of sample (1-10 mg) is contained within a closed crucible and placed into a temperature controlled furnace. A second crucible is used as a reference. The sample is then heated by the temperature controlled furnace. The most commonly used method of temperature control is dynamic (or scanning) mode which utilizes a constant heating rate. Another mode of operation is isothermal mode and is used to maintain a constant temperature. In both of these modes, the heat flow to or from the sample is measured as a function of time and temperature. Fauske & Associates, LLC (FAI) specializes in performing DSC tests on reactive chemical samples. High pressure crucibles are used to accommodate pressure generation due to both vapor and non-condensable gas. 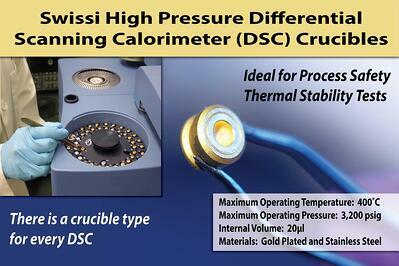 DSC data provides an excellent screening tool with which to identify the thermal hazard potential of a sample. Thermogravimetric Analysis (TGA) measures the change in mass of a sample under controlled heating conditions. A small amount of sample (1-10 mg) is contained within an open crucible and placed into a temperature controlled furnace. A second crucible is used as a reference. The sample is then heated by the temperature controlled furnace. The most commonly used method of temperature control is dynamic (or scanning) mode and is used to increase the furnace temperature at a constant heating rate. Another mode of operation is isothermal mode and is used to maintain the furnace at a constant temperature. In both of these modes, the mass loss (or gain) of the sample is measured as a function of time and temperature. The Accelerating Rate Calorimeter (ARC) is a high thermal inertia adiabatic calorimeter that is used to obtain data regarding the relationships between time, temperature, and pressure for exothermic reactions. 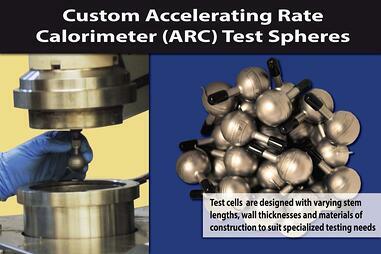 The ARC utilizes a 10 ml spherical test cell constructed of stainless steel, Hastelloy C, titanium, or tantalum. 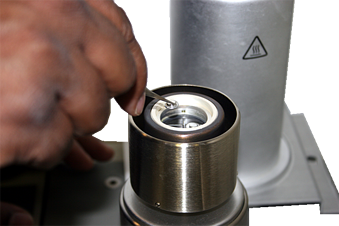 The pressure generated by a sample must be contained within the test cell. To accomplish this, ARC test cells use heavy walled test cells capable of withstanding pressures up to 3,000 psi or more. As a consequence, the thermal inertia, or phi-factor, of the system is relatively high. The combined mass of the sample and the test cell are kept adiabatic, not just the sample itself. For this reason, care must be taken when applying this data to large scale hazard evaluations. The ARC can be run in two modes of operation. The first, and most common mode of operation, is heat-wait-search mode. In this mode, the exothermic activity of the sample is monitored through a series of preprogrammed temperature steps. When a reaction is detected, the heaters are programmed to match the temperature of the system. The ARC can also be run in isothermal mode. In this mode, the system is heated to the desired initial temperature. The instrument can then be programmed to track a reaction if exothermic activity is detected or maintain the desired temperature. Fauske & Associates, LLC (FAI) Accelerating Rate Calorimetry (ARC) contract testing service test protocol conforms to ASTM E 1981, “Standard Guide for Assessing the Thermal Stability of Materials by Methods of Accelerating Rate Calorimetry”. A sample size of 0.5 to 10 grams is typically required for each test. The Thermal Activity Monitor (TAM) is an isothermal microcalorimeter designed to monitor a wide range of chemical and biological reactions. The system can quantify exothermic and endothermic processes at a chosen test temperature between 5 and 90°C. 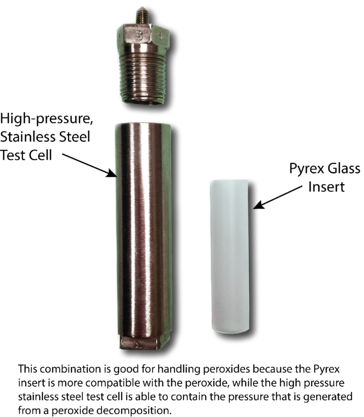 The TAM utilizes 4 ml test cells constructed of glass, stainless steel, or Hastelloy C. Stainless steel and Hastelloy C test cells allow for pressure generation up to 8 bar. Fauske & Associates, LLC (FAI) Thermal Activity Monitor (TAM) contract testing service test protocol conforms to the operational recommendations made by the instruments manufacturer. A sample size of 0.5 to 2 grams is typically required for each test. Critical process safety and thermal stability parameters (TMRad, SADT, etc.) 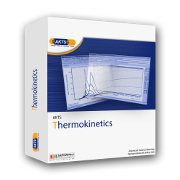 can be determined quickly and reliably from a modest amount of calorimetry data by using AKTS-Thermokinetics software. This software utilizes an advanced differential isoconversional kinetic technique for the precise modeling of runaway chemical reactions. From just a few DSC tests, run in either dynamic or isothermal mode, model-free kinetics can be extracted. The model-free kinetics can then be used to predict reactivity of varying quantities of material in different thermal environments. Verification of the model can be completed by a comparison of the measured and calculated reaction profiles, either rates or conversion, under both non-isothermal and isothermal conditions. Further validation can be performed using a single adiabatic calorimetry experiment. Fauske & Associates, LLC (FAI) has experience utilizing AKTS-Thermokinetics software for kinetic analysis and is also an authorized distributor. As you can see, the C80 is a fantastic addition to our toolkit here at FAI as it nicely complements other instruments in our lab and enhances the ability of our engineers to offer practical and customized solutions to unique process safety issues dealing with thermal hazards and thermal stability. When you are considering a provider for your own process safety needs in this area make sure that they too have a robust toolkit with which to effectively address your concerns. What is the thermal impact of line break on equipment?